Pros: In spite of another review suggesting sleep/suspend doesn't do as prescribed, the item comes with instructions in regards to the BIOS and how to set proper settings. This item does do as it claims, even in sleep mode, if the BIOS has the correct settings and is set correctly. It pretty much works on any machine when using hibernate, but I don't use hibernate except on laptops. Cons: I wanted to get this for more than one machine, but most of mine and my clients' machines don't have the necessary adjustments for it. Newer UPS have this, but I don't know many people who need or use a UPS as opposed to surge protection. Pros: I give it two "C's" because everything about it seems durable, professional-grade and well-made, unlike some other items you pick up and immediately think "looks like a cheap piece of junk." Hopefully, it does it what it's supposed to ... if I ran Windows. I bought it because it was the smallest "smart" power outlet I could find online. If it worked like other smart-strips and did not require the USB cable I would give this five Cs. The included USB cable is extra thick and durable (though this also means the folded-up USB cable takes up almost as much space as the outlet). Cons: Only 171 joules surge protector, not what I'd use to protect expensive equipment unless I attached a heavier-duty surge protector. No idea if the second outlet works because the item description did NOT say that it works ONLY with PCs running Windows. Unlike smart strips with autoswitching technology that turn other outlets on-and-off anytime a device is powered on in the "master" plug, this technology is totally useless with either a Mac computer or stereo equipment. Unlike other smart strips, this one takes up another USB port on your computer. No idea if it will still communicate with your Windows computer if attached through a USB hub (esp. an unpowered hub). Other Thoughts: USB cable has green-tinted see-through cable housing that allows you to see the thick braided cable underneath. User manual says "every time you start-up Windows, the USB cable sends a signal to the Mini Power Minder which turns on the secondary socket thus powering up your peripherals. The reverse action occurs when you shut down your computer." So apparently does not power down peripherals if your computer goes to sleep, but only when you shut down completely. 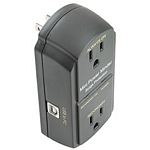 The Mini Power Minder is not Microsoft Windows-specific. However, the computer that connects to the Mini Power Minder's USB port must disconnect power to its own USB ports when it shutsdown. More and more, computers maintain voltage to the USB ports so you can use them to charge devices, even when the computer is "off." 1 out of 1 customers found this review helpful. Did You?